The FIA (Fire Industry Association) has released the results of its Market Conditions Survey, Wave 7. This survey is a snapshot of the current trends within the fire industry nationwide. 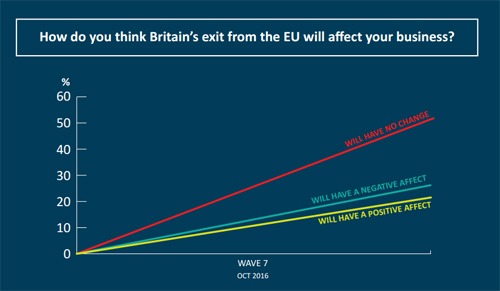 Each Wave is conducted every six months with Wave 7 revealing the impact of the recent changes in the political landscape, the trends within the market, as well as other emerging issues, such as the need for more skilled engineers. During the last six months there have been a lot of changes in both the political and economic stratosphere: a new Prime Minister, a vote to leave the EU, and a drop in the value of the Pound Sterling. But how will this affect business? 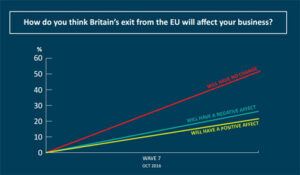 The respondents to the survey revealed that Brexit would have no impact on business (see graph). CEO Ian Moore said that this was a positive attitude to have, stating that throughout the transition out of the EU, the FIA will ‘support businesses as we always have’, even though the data shows ‘a slight decline in sales enquiries this time around’. However, for exporters, the referendum seems not have had much of an impact – export businesses reported that they had grown either ‘slightly more’ or ‘stayed the same’. Ian Moore highlighted that in order to solve this issue we must realise that the lack of skilled labour is a nationwide problem, and we must act now. He highlighted the need for to educate the wider world of the industry to gain interest in new careers within the industry and also for companies to back apprenticeship schemes and training.